Click here to access the best cabin price on the internet - which cabin will it be today. Be sure to book mark this page as our deal of the day changes at midnight, everyday ! Buying a log cabin for your garden is a great way to add more space, not only does it extend your living space but is cost effective and versatile. Cheaper, quicker and less intrusive than adding an extension. You could also take it with you when you move. We have been in the garden building business since 2001, and have built our reputation on providing quality, well-built log cabins at very competitive prices. We offer a wide range of garden buildings in various designs, sizes and wall log thicknesses from 34mm through to the impressive and sturdy 68mm with double grooved interlock joins. Our comprehensive range includes single room log cabins, multi room log cabins, garden offices, summer houses, camping pods, garages and car ports, so we are bound to have something that will suit your needs. 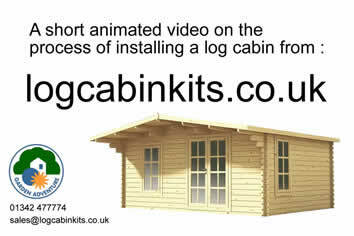 Most of our log cabins are expandable and customisable, with different roof, door and window options, but if you are not sure what model to choose or have specific requirements then you can either use our cabin search facility to select different options of size, log thickness and roof type, or give us a call on 01342 477774 for more information or to discuss. The log cabins are designed to be easy to build for a competent DIYer, but we can also provide a professional installation service. We have a strong trading relationship with our supplier, Eurovudas, ensuring consistency in product and designs that are perfect for our customers. We believe that together with our competitive prices, the excellent quality and attention to detail, that we offer the best value garden buildings ! 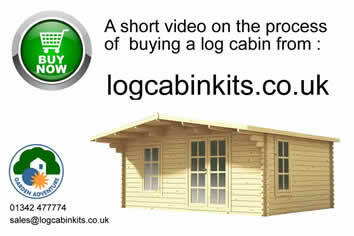 Order online or telephone us today to buy the perfect log cabin for you ! Our most widely chosen wall thickness is 44mm. All our garden buildings in this size come with double glazing as standard, you can view all our wood cabins for sale showing you all the options available on this page. Note - most buildings that have a ridge height of more than 2.5m and fall outside the planning requirement (when a building is positioned less than 2.0m from your boundary) can be manufactured with a ridge height of 2.5m - please call for details. With 18 years (est. 2001) of experience selling and installing interlocking wooden cabins we have produced a comprehensive set of documents providing useful tips and advise to those that want to install a garden building - and there is no reason not to with just a modicum of DIY ability, most will find installation a breeze. Take a look at our knowledge base for answers to the questions most asked and our news page. 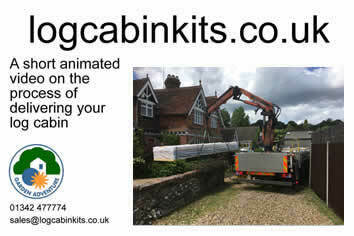 In most cases your new garden cabin will not need planning permission but there are cases where this will apply. It is worthwhile carrying out a little research before you start work on your project. The government provide a web based guide called Planning Portal. This also gives information on Building regulations. We can deliver our buildings throughout UK mainland - lead time will depend on your location in relation to our UK hub in Leicester. Delivery can only be made to mainland destinations, if the final destination is to any islands, we can drop of at a mainland port of your choice - the onward transportation must be arranged by the customer. Please allow additional time for deliveries to the extremities of the Uk including the South West, North Wales and Scotland. 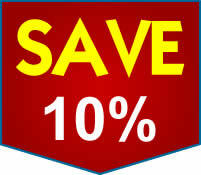 Our usual lead time is between 3 and four weeks subject to availability and seasonal demands.